"The late, great Yogi Berra said it best, "You can observe a lot by watching." 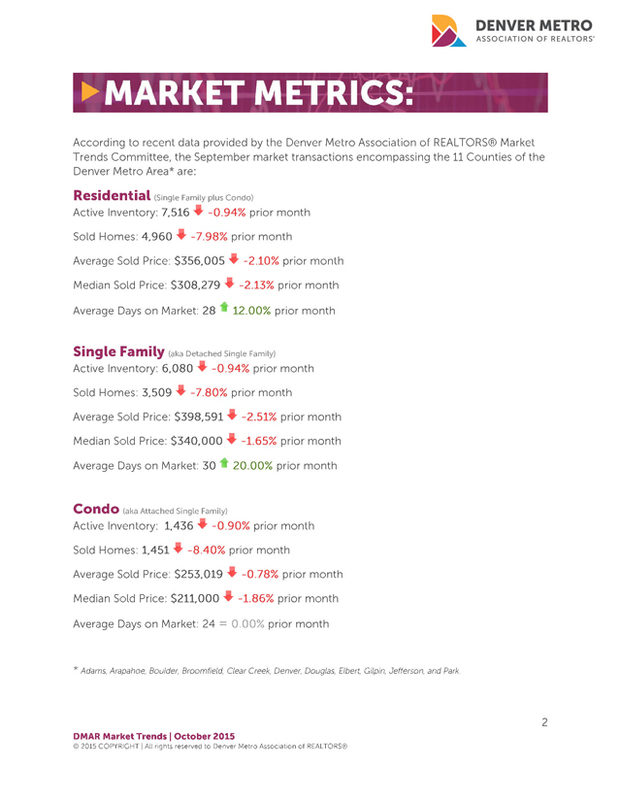 Without question, the same rings true for those who track MLS market statistics because in order to truly understand the Greater Denver real estate market, it's essential to watch for signs in the month-over-month stats while also observing the year-over-year trends to appreciate the impact on home buyers and sellers. 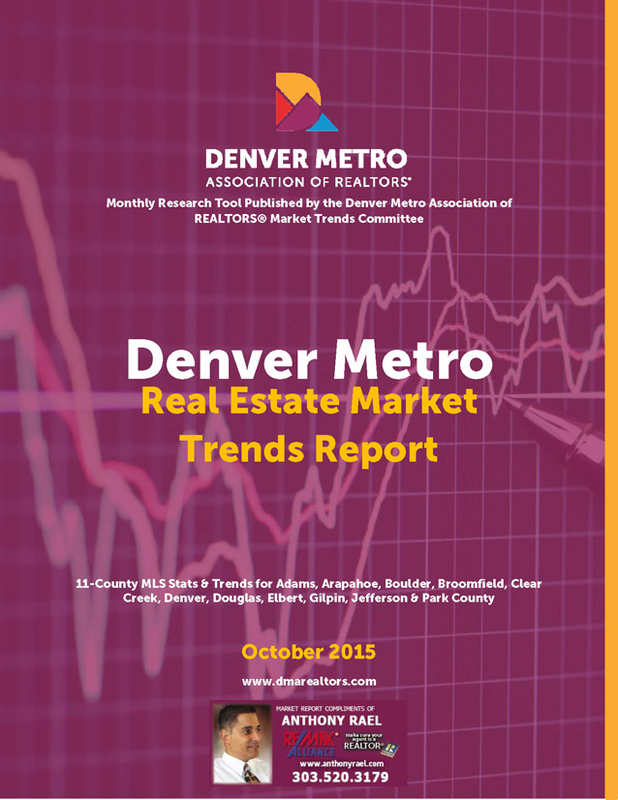 As we dig into the September MLS stats and trends: 5,847 New Residential (RES) Listings came on the market while 4,844 homes were placed under contract and 4,960 homes Sold and Closed. 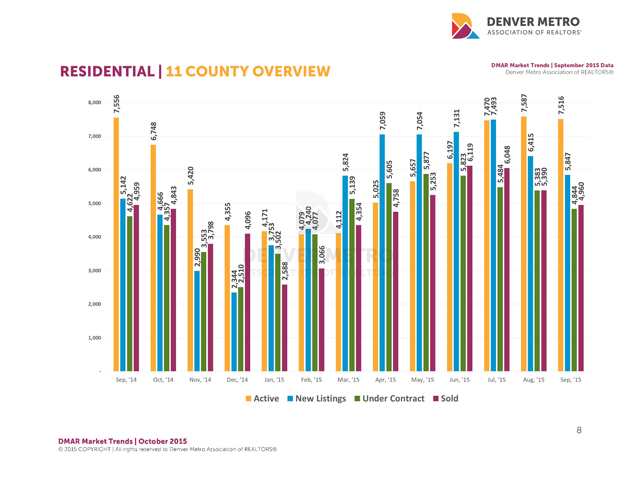 We closed out the month with 7,516 Active Listings – representing a 0.94% decrease over the previous month, which was 0.53% fewer than what we had available in September 2014. However, as we look at the month-over-month Detached Single Family Home market, we saw a significant decrease of 8.67% in New Listings, but this also represents a 12.71% year-over-year increase. 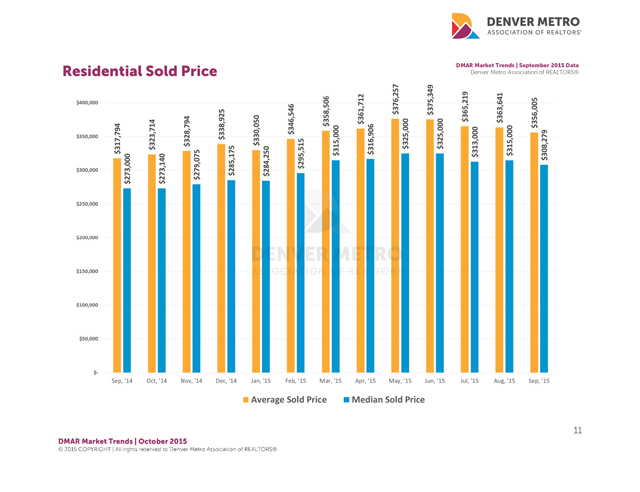 The Average and Median Sold Prices decreased from the previous month at -2.51% to $398,591 and -1.65% to $340,000 respectively – representing 11.04% and 9.71% year-over-year increases. The Condo market (aka Attached Single Family) showed the supply of New Listings dropped 9.35% over the previous month, but increased 16.45% year-over-year. The Average Sold Prices slipped by 0.78% to $253,019 and the Median Price fell by 1.86% to $211,000. 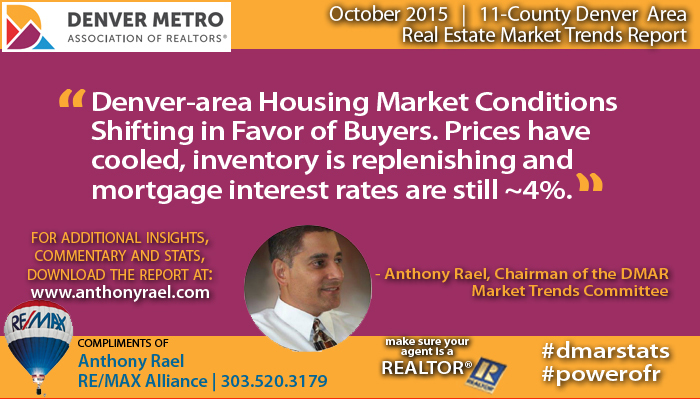 However, year-over-year Average and Median sold Condo prices appreciated a whopping 16.20% and 17.42% respectively! For the entire Residential (RES) market, which includes Attached and Detached properties, Under Contracts decreased by 10%; Sold Listings decreased 7.98% and total Sales Volume dropped 9.91% to $1.76B from the previous month, but is up 12.05% over the same period last year. 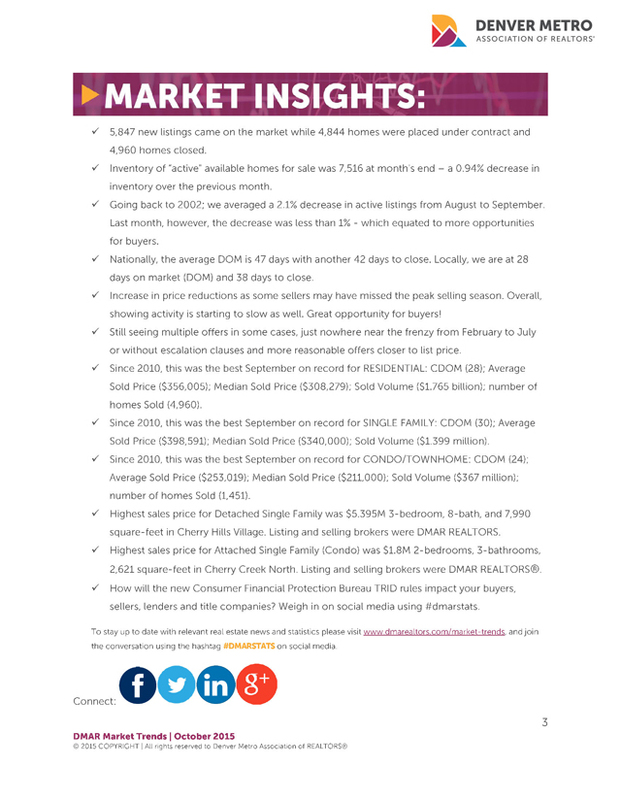 Finally, a quick summary of the Year-to-Date (YTD) Residential market stats shows new listings at 54,816; DOM at 29; Average Price at $362,200 and a record-smashing $15.4B in total Sales Volume (a 15% increase over 2014). Late last month, the Federal Reserve decided to leave interest rates alone and, within days, mortgage rates dipped even lower which has buyers giddy with excitement and ready to line up to write offers during October – which is generally considered the best time of year to purchase a home. We will continue to see brisk sales throughout the fall, but it's not yet known how the new Consumer Financial Protection Bureau TRID rules will impact closings. Most feel the average days of closing a financed deal will increase from 30 to 45 days, but results will vary depending on how educated and prepared lenders, title companies and real estate agents are moving forward."